The San Diego Comic Con countdown continues! Super7 will announce (at least) one SDCC Exclusive Vinyl Toy each weekday until the entire line has been revealed. The exclusives will only be available at Super7’s booth #5245 – they will not be available on super7store.com before or after the event! Be it ancient asteroids, impossible aging, or aerobic decomposition, you can’t keep a good kaiju down! Clear the streets (and your toy shelf) as FOSSILLA RAIDS AGAIN! 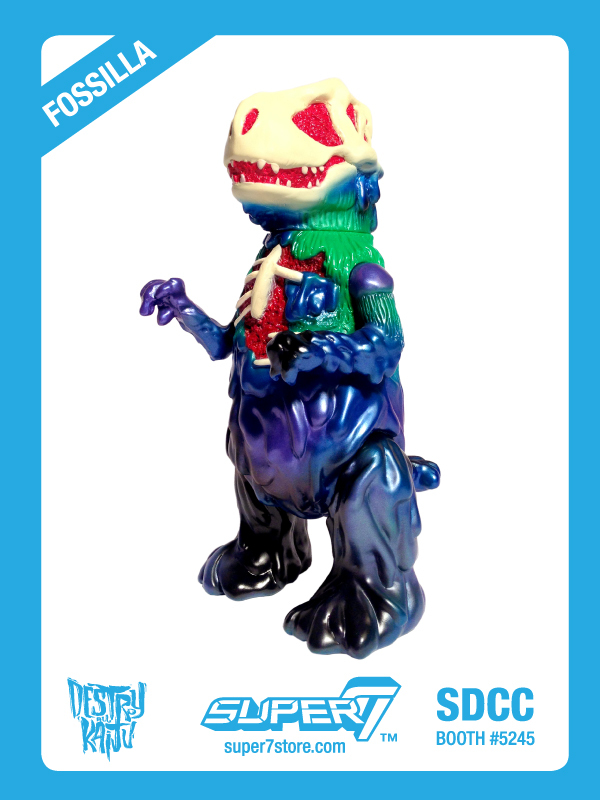 Joshua Herbolsheimer’s part-dino, part-skeleton, part-sludge… all-kaiju creation is cast in goopy green vinyl and decorated black, violet, and metallic purple sprays along with blood red guts and bleached bones. This popular prehistoric personality is a member of the DESTROY ALL KAIJU! line of standard-sized (approximately 9” tall) vintage-inspired vinyl figures, and is able to be posed at the neck, shoulders, and thunderous thighs. SDCC EXCLUSIVE ALIEN REACTION FIGURE REVIEW!